Are you looking for an innovative way to market your business? New social media sites are constantly emerging. Whether your brand is using Facebook, Twitter, Google+, Instagram, or another other social media site as a part of your marketing strategy, the goal is similar – you are want to promote and grow your business. With the number of social media apps that are coming to the scene, it continues to create opportunities for marketers to advertise to a diverse group of people. It is amazing that statistics show that over 25 percent of the population is actively using social media. The possibilities to market your brand are endless. 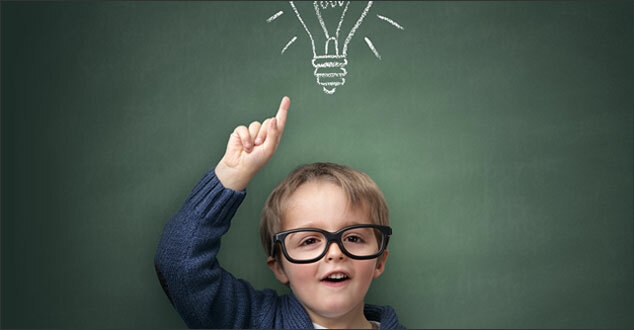 With some creativity you could see some amazing marketing opportunities. Let’s take a look at 2 specific examples of ways that brands have used unconventional ways to market their company with social media. Snapchat is a social media site that might be more known if it’s younger audience, and its possible sexual messaging services. However, the growing popularity of the site has given marketers time to pause. Facebook even tried to buy the site from Snapchat for 3 billion dollars, but was turned down. Facebook did create Facebook poke, which is essentially exactly the same concept as Snapchat. The site is known for taking “snaps” or photos that will be deleted in 10 seconds. At first glance, this doesn’t seem like the easiest way to promote your business when you have an image that deletes right away. Frozen yogurt company, 16 Handles, took on the challenge. Mr. Britten, the created the “Snappy New Year” campaign. The promotion worked in three ways. The first step was for the followers to send a Snapchat image of themselves eating a cup of 16 Handles frozen yogurt directly to the 16 handles Snapchat account. 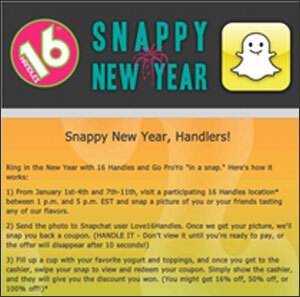 16 Handles would automatically send a Snapchat of a coupon image directly back to that person.The last step would be for that users to go into the frozen yogurt store and present the coupon. The coupons ranged from 16% – 100% off. The trick was that they had to open the Snap once they were in the store as they were checking out, due to the fact that the coupon would be deleted in 10 seconds. Utilizing the “Snappy New Year” campaign is just one innovative way that a company can creatively promote their business to a specific audience. While Snapchat may not be the best place for your business to promote, maintaining your social media presence is the crucial part and finding creative ways to promote your business within the means of a social site could help to separate your business from others. Vine is a mobile only, social media site that allows you to create short – 6 second long – videos and then you upload them to other sites like Facebook and Twitter, or embed them into your website. The great part of Vine is the simplicity and the ability to hit at short attention spans. Oreo is famous for its content marketing thanks to campaigns like #oreasnackhack. Oreo took the 6 second videos to create fun and engaging videos where they are using Oreos in unconventional ways, and they encouraged their following to do the same and use the hashtag: #oreonsnackhack. New fun ideas popped up like putting Oreos in a pepper grinder to add as an ice cream topper, or added flavor to your popcorn. Oreo has done just that; they have hit directly at where their fans are most interested in and they utilized social media in a very different and engaging way. By no means, am I saying that you need to jump onto another social media site. Social media can be overwhelming for anyone, but especially smaller businesses. The pressure is strong to jump into the next big thing. Instead of spending time and energy trying to keep up with the newest site, seek ways to find innovative ways to communicate your brand. It can be cost effective, and a fun way to connect with your followers and fans. The key idea is that you need to know your own brand and know the direction you are taking your business. Do you feel the pressure to join new social media sites emerging to the scene? How have you used the social media platform that you are on now to creatively promote your business? Please share your experience with me in the comments below.